Part Used & Method for Pharmaceutical Preparations: The slough shed by the cicada is found on the ground or on the branches of trees, then dried in the sun. 1. Wind-heat exterior syndrome manifested as fever, headache, sore throat and hoarse voice. Cicada slough (Chantui) is used with Boat sterculia seed (Pangdahai), Arctium fruit (Niubangzi) and Platycodon root (Jiegeng). 2. Early stage of measles without rash. Cicada slough (Chantui) is used with Pueraria root (Gegen) and Arctium fruit (Niubangzi). 3. Itching due to the surface being attacked by exogenous wind. Cicada slough (Chantui) is used with Tribulus fruit (Baijili) and Schizonepeta (Jingjie). 4. Wind-heat of liver meridian manifested as red eyes, watery eyes and blurred vision. Cicada slough (Chantui) is used with Chrysanthemum flower (Juhua) and Shave grass (Muzei) in the formula Chan Hua San. 5. Convulsions and spasms due to tetanus or high fever. 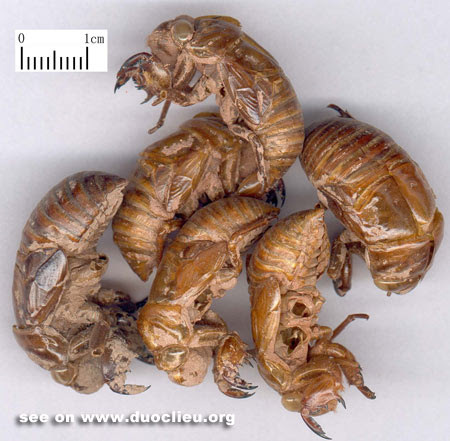 Cicada slough (Chantui) is used with Scorpion (Quanxie), White-stiff silkworm (Baijiangcan), Uncaria stem (Gouteng) and Chrysanthemum flower (Juhua).